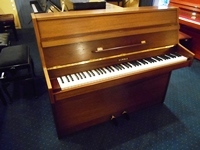 A good English upright in a satin mahogany case, contemporary style. A very neat and compact piano. Manufactured circa. 1978. Renovated and offered in good order. Some case fading, hence price. 7 octave keyboard. 2 pedals (1/2 blow and sustain). Overstrung with a full iron frame. Height = 109 cms. Width = 130 cms. Depth = 46 cms. late 1970's/ early 1980's in a lightwood case. 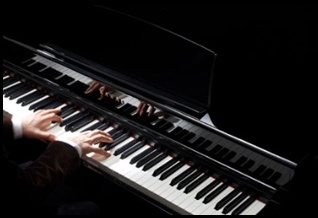 7 octave keyboard. 2 pedals. Overstrung with a full iron frame. Under damper action. inclusive of VAT, delivery to ground floor, 1st tuning and 3 year guarantee. 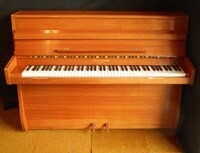 A modern, compact upright piano, renovated and offered in good order, in a bright mahogany case. 7 1/4 octave keyboard. 3 pedals (½ blow, celeste and sustain). Overstrung with a full iron frame. Under damper action. Tuned to A=440. Inclusive of VAT, delivery to ground floor, first tuning and 2 year guarantee.